I recently read an article that talked about the subject of drinking when stuck “living on a rock (island)”. 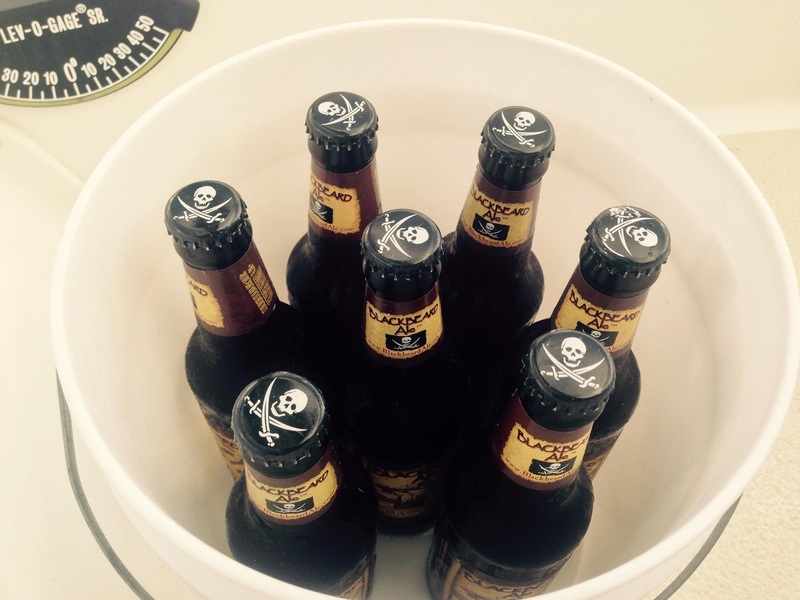 Even though we are not “stuck” on any one rock, drinking is definitely predominant in the sailing community as well. I mean, when one fantasizes of being on a white beach in the tropics, or watching the sun set from your boat, you have a drink in hand. Now multiply that by “every night” and that equals a lot of drinks in hands. When you take away all of the things that one “has to do” or has for distractions in the “regular world” what are you left with. You no longer go to work, or meet up with friends at the mall, or to go to the movies, or to go hiking the nearest mountain, or vege in front of you tv. No you are calling each other on your VHF to head to the nearest beach, and with the beach comes refreshments. Often times when I head to the beach with the kids, the easiest/cheapest form of entertainment for them, we pack 1-2 bottles of water, and if it is after “noon” (yes I have my limits as to what time is too early to start drinking) then one rum drink as well. Why the rum? Well, 90% of the time the girls will chug the water in a matter of minutes after having left the boat, so the rum is the only thing I get to keep all to myself, for obvious reasons. If it were more water, or juice, or anything non alcoholic they would be after me incessantly to have some, but as soon as I say there is rum in it, or better yet that it’s a “Mommy drink” then they leave me alone. So rum drink = liquid for me, and some peace from my kids! Now I am not the only one that “drinks like a sailor”. I even think that we are on the lighter side of the scale compared to some boaters. But I am not here to compare, I understand. Being sailors there are a million and one reasons to have a drink in hand: socializing, HAPPY HOUR, bonfires, potlucks, boredom, SOMETHING BROKE ON YOUR BOAT, you fixed something on your boat, its too hot to do anything else, the waters too choppy to leave the boat, there’s a storm coming, THE STORM HAS PASSED, you just returned to your boat after a long day on land, you’re having a bad day, you’re having a good day, YOU ARE A PARENT, you just spent way too long at customs/immigration, your mail hasn’t arrived, marital problems, birthday party, beach hangout, you’re playing tourist for the day, you killing “island” time, GIRLS’ NIGHT, you’re on a high from arriving at a new island, you had a good crossing, you had a bad crossing, SUNDOWNERS. And the list goes on and on and on. Pick any one of these, or a combination of many, and you have a reason to have a cold drink in hand. Why don’t you hear much about this before you set sail? Honestly, the shame! When US dietary guidelines are 1 drink per day for women and up to 2 drinks per day for men, where does that land us? It catapults us into the “heavy drinkers” column, which is nothing something you want your family, blog readers, non-boaters, or doctor finding out about! Whenever Eben and I get on the subject we ask each other “do you think my drinking is ok?” and if we can answer yes than we are happy. We are not craving drinks, we are not hooked, we have both done stints of not drinking (for health benefits and pregnancies) and didn’t end up on the floor crying. Well except for that one time where I was 9 months pregnant and really wanted Baileys, but I blame that on hormones! Drinks play well into our lifestyle. We spend the morning with the girls, teaching, playing, discovering, etc. Once the kids have napped and eaten it’s time to hit the beach for some afternoon playtime with friends, which usually aligns with a 2 for 1 drink special somewhere (Happy Hour!). Then we all break for supper, and reconvene in someone’s cockpit for night caps, and adult time once the kids are asleep, with more drinks. It’s sort of just part of the lifestyle. There are a few steps you can take to avoid yourself some pain. Bring your own drinks. Whenever you can, if you are going to meet up with people, bring your own drinks. You don’t want to spend all your cruising kitty on beach bars, where the costs of drinks are not cheap, and buying rounds adds up quick. When rum and beer is so cheap, just bring your own to the party (where permitted of course). You also don’t want to be that sailor that goes over to someone else’s boat to hang or have dinner and drinks their entire stash of booze. So again, BYOB. The best way to do this we have found is with a Tervis tumbler and bottles+mix in the back pack. With this combo you are set to enjoy the beach, the sunset, your friends, while your drink stays cool in that insulated cup of yours. Get the lid too, it saves you a lot of clean up if your drink gets knocked over in the dinghy ride there. By bringing your own drinks you also know HOW MUCH you are drinking. 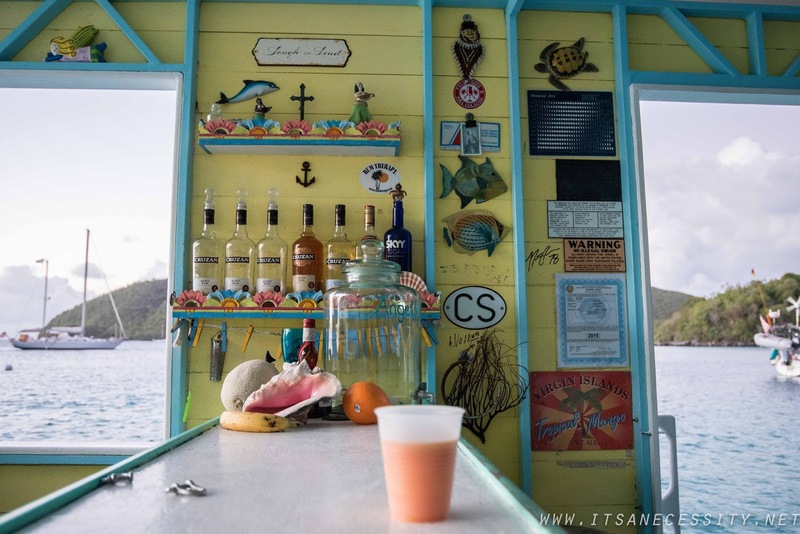 In the caribbean the alcohol is cheaper than the mix, and the ice, which means often times when you order something at the bar you are getting a glass full of booze with a splash of juice “for color”. This can be a very slippery slope leading you to bow down to the porcelain thrown when you “had just 3 drinks” but they were 90% alcohol each. OUCH! Foxy’s in Jost Van Dyke. Known for their Painkillers. With the cost of drinking “out”, it is smart take advantage of Happy Hours. 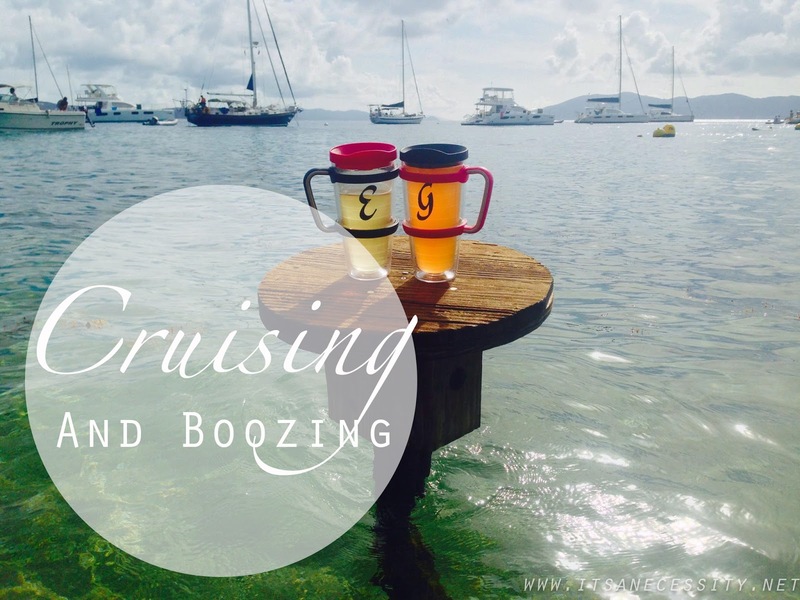 Drinks in the Virgin Islands range from $8-14, it hurts to drink! So if you can hold off until the wonderful hour when drinks go on sale your wallet will thank you. Pace yourself and stay hydrated. Drinking is one of the main reasons for “boaters midnight” (9pm). When you start drinking early you usually end drinking early, which can mean that you are nicely tucked in to bed at way too early of an hour and that you are missing out on some fun evening activities. Bring a bottle of water and go 1 for 1. For every one alcohol drink you consume, drink that same amount in water, before you continue. You will thank me some day! Take this post with a grain of salt. No one is forcing you to drink. You will not be the party pooper if you are at the potluck drinking pepsi rather than a rum and coke. Continue consuming at your own levels while keeping your health in mind. Make wise decisions, do not mix boating and drinking, sailing is dangerous enough as it is. But know that much of cruising and socializing does typically revolve around drinking, so prepare yourself for the non stop party! yes being on a dock, or hurricane season where there is more sitting around, will make consumption sky rocket. That and the influence of dock neighbours! ugh boat hangovers are absolutely the worst! 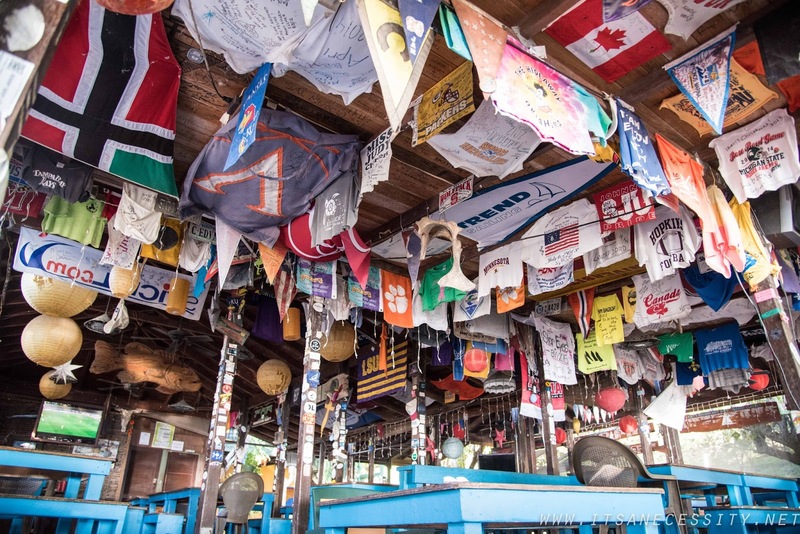 Drinking at Foxy's can lead to autographed thong (white in this exampled) stapled to the ceiling…. and an interesting dinghy ride back to boat whne there was also a short skirt involved. I think drinking at Foxy's brings out the worst in everyone…that place is dangerous! I always enjoyed getting creative with whatever alcohol and mixers you may have aboard at any given moment. Like grapefruit juice and coconut rum with a dash of lime seltzer! 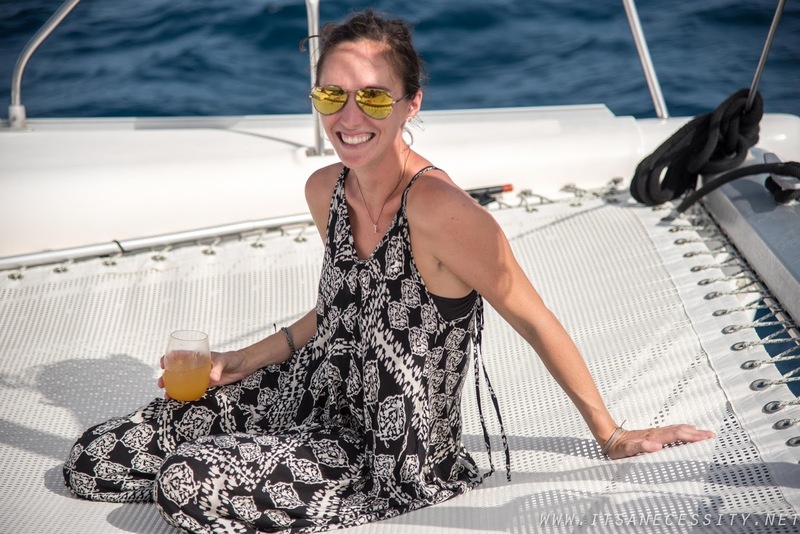 Cruising makes you think out of the box about many things, drinks included 🙂 And of course not having ice on board makes one prepare by putting the mixers in the fridge hours in advance. I love how many different cheap flavored rums there are when you get into the islands. I think I have tried almost every one of them!